Why on Earth would I want to do Pilates indoors if the reason I cycle is to get out and about and feel the wind whistling through my helmet? Hopefully this post will help give you an insight into how Pilates can improve your performance and endurance on the bike. As anyone who’s ever ridden a bike belonging to someone else knows, cycling position is all-important. You might feel comfortable for the first hour or so, but a keen cyclist will be out dawn to dusk, often covering over one hundred miles in a day. Even if your bike fits you well, the cycling position is challenging to sustain. As you fatigue, your posture suffers – shoulders become hunched, the head drops so that the neck has to be put in an increasingly strained position. The stomach muscles tire after supporting your upper body position all day and the pelvis tilts backwards to compensate. This can lead to a lot of strain on the low back and reduced power output in the legs. There are lots of measurements available online to help you set your bike up to fit you better, and to get better power from the legs. However, everyone is different and your own personal shape and abilities might not suit a generic set-up. You might have stiffer hips than others, or a history of shoulder pain, both of which will make a different set-up work better for you. If you can, a proper bike-fit where your power output can be assessed before and after can help you whizz along effortlessly! There’s no denying that getting out on the bike is the most specific training required to build up the cycling specific muscles. So, where does Pilates fit in? Pilates trains stability throughout the trunk, which helps support the quads, hamstrings and calf muscles as they transmit force into the pedal, and support the shoulders and neck as they maintain a steady position. Watch a few moments of the pros in time trial action, even when fatigued at the end, their upper body barely moves when they are sitting on the saddle. This is down to spectacular muscle endurance. Even though cycling is generally an endurance sport, there is good evidence that strength and power training improve endurance performance. These exercises do not need to be done too frequently, twice a week is sufficient. Therefore, the exercises do not cause the cyclists’ feared bulk-up. Instead, supplementing training with a full body regime, like Pilates, helps the muscles fire more effectively. This leads to more efficient cycling – faster with less effort, who wouldn’t want that?! The focus in Pilates for cyclists is on maintaining strength and endurance in the cycling position but also to recognise that cycling posture is not sustainable: when a cyclist is not on the bike, they must be able to come back out of the cycling position into a more neutral posture to prevent aches and pains arising in day to day activities. 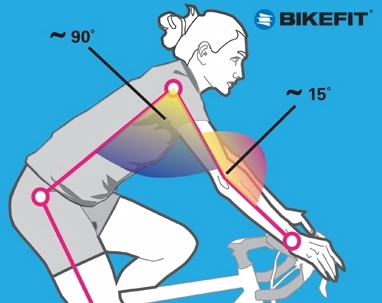 For example, in cycling the shoulderblades are more tilted and rounded than in upright standing (and this is exaggerated in a cyclist who spends a lot of time on the aero bars). A Pilates programme for a cyclist can help to strengthen them in this position and also teach good posture when they get off the bike. 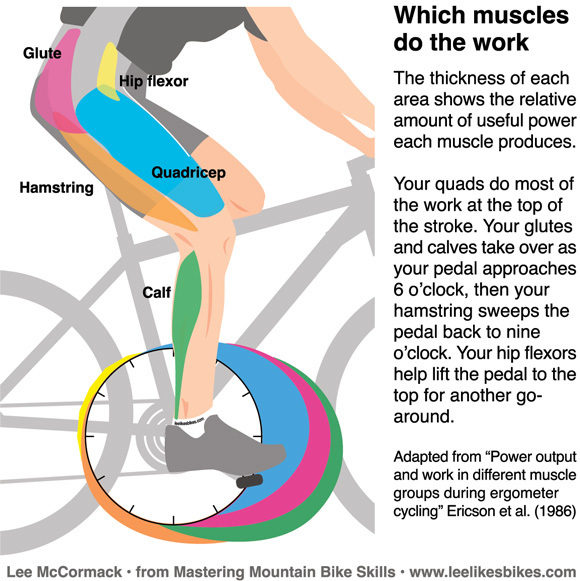 Similarly, around the hips and pelvis, a strong core is vital in cycling, but the power generation comes from the gluteals (bottom muscles), hip flexors, quads (thigh muscles) and hamstrings (at the back of the thigh). The power is transmitted through the calf and shin muscles which keep the feet in a stable position to transfer the power into the pedals. It’s important to get the foot properly aligned via the set up of the cleats to make sure of good alignment in the legs. Getting the muscles working well together is also vital for good cycling performance. The quads and glutes push the pedal down while the hamstrings and hip flexors pull the opposite pedal up. A well-designed Pilates programme for a cyclist will get these muscles firing well and improve their endurance.